The study is a description of public finance in Poland made by comparing the most important features of this sector in Poland and Central and Eastern European countries, European Union and OECD in the period 2004-2014. The following topics are discussed: scope of the public sector, sources of public revenue, public spending mix, deficit and debt figures. The focus of this study is on identifying the most important similarities and differences. The main assumptions of the 2016 state budget are also analysed. 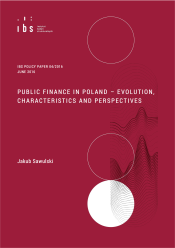 The study may serve as a starting point for the debate on desired directions of the future evolution of Polish public finance.